[134 Pages Report] The biometrics-as-a-service market accounted for USD 686.0 Million in 2016 and is projected to reach USD 2972.8 Million by 2022, at a Compound Annual Growth Rate (CAGR) of 28.82%. The growing requirement for cost-effective biometric solutions required to access advanced biometrics capabilities is the major growth driver of the market. In this report, 2016 is considered as the base year and 2017–2022 is the forecast period. The main objective of this report is to define, describe, and forecast the global biometrics-as-a-service market on the basis of modality type, application, deployment model, organization size, industry, and region. The report provides detailed information about the major factors (drivers, restraints, opportunities, and industry-specific challenges) influencing the growth of the market. The report aims to strategically analyze the micromarkets with respect to individual growth trends, prospects, and contributions to the global market. The report also attempts to forecast the market size of the 5 main regions: North America, Europe, Asia Pacific (APAC), Middle East and Africa (MEA), and Latin America. It strategically profiles the key market players and comprehensively analyzes their core competencies. It also tracks and analyzes the competitive developments, such as joint ventures, mergers and acquisitions, new developments, and Research and Development (R&D) activities, in the biometrics-as-a-service market. 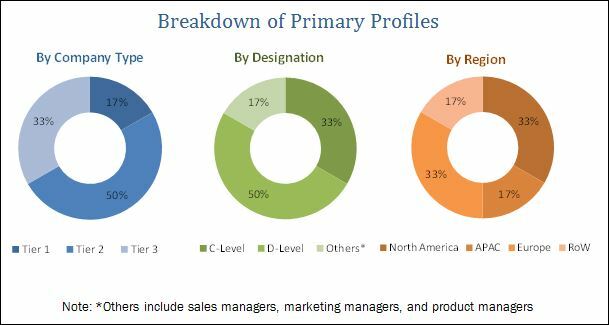 The biometrics-as-a-service market includes various vendors, such as Fujitsu (Japan), BioID (Switzerland), HYPR (US), Aware, Inc. (US), M2SYS (US), OT-Morpho (France), SUPREMA (South Korea), Leidos (US), CERTIFY GLOBAL (US), ImageWare Systems (US), IriTech (US), SkyBiometry (Lithuania), Polygon Innovation (Portugal), RightPatient (US), VoiceIt Technologies (US), Athena Sciences Corporation (US), SmilePass (UK), BYTES TECHNOLOGY GROUP-Bytes SI (South Africa), SecurAX (India), Accenture (Ireland), Fulcrum Biometrics (US), AimBrain (UK), Certibio (Brazil), VoicePIN.com (Poland), and SpeechPro (US). These Biometrics as a Service Vendors are rated and listed by us on the basis of product quality, reliability, and their business strategy. Please visit 360Quadrants to see the vendor listing of Biometrics as a Service. The global biometrics-as-a-service market is expected to grow from USD 838.0 Million in 2017 to USD 2,972.8 Million by 2022, at a Compound Annual Growth Rate (CAGR) of 28.82%. Biometrics-as-a-service deals with offering capabilities such as biometrics onboarding, duplicate checking, and authentication-as-a-service over the internet, through a cloud based infrastructure. The biometric services capture both physiological and behavioral aspects of human beings, thus providing authentication based on fingerprint, face, iris, voice, and vein, among others. These services are witnessing a rise in demand as they are finding utility in identification and verification applications from industries such as Banking, Financial Services, and Insurance (BFSI), government, and retail. This report provides detailed insights into the biometrics-as-a-service market, split across various regions, segments, and industries. The market is segmented on the basis of modality types into unimodal and multimodal. The unimodal segment includes fingerprint scanning, facial recognition, iris recognition, voice recognition, palm, and vein recognition, and others (DNA and signature recognition). The applications considered for the market include mobile banking, payments, and authentication; identity proofing and credentialing; law enforcement and border control; civil identity and elections; workforce management; and others (account recovery, de-duplication, and access control). The deployment model for the biometrics-as-a-service market consists of public cloud, private cloud, and hybrid cloud deployments. The market is also segmented on the basis of organization sizes into Small and Medium-sized Enterprises (SMEs) and large enterprises. The large enterprises segment is expected to have the larger market size, due to high demand for scalable infrastructure to secure their facilities. The growing security threats across the globe and the increasing usage of mobile devices are expected to create significant demand for biometrics-as-a-service solutions and fuel the growth of the market. The report covers all the major aspects of the biometrics-as-a-service market and provides an in-depth analysis across the regions of North America, Europe, Asia Pacific (APAC), Middle East and Africa (MEA), and Latin America. The market in North America is expected to have the largest market share, due to the presence of major vendors, and increasing adoption of associated services. The APAC region is expected to provide several opportunities in the market and is projected to grow at the highest CAGR during the forecast period. However, biometrics-as-a-service stores the biometric data on the cloud and concerns related to the security of this data may act as a restraining factor for the market growth. Various vendors provide biometrics-as-a-service solutions to help enterprises reduce their Capital Expenditure (CAPEX). Aware, Inc. (US) is one of the major vendors that offer biometrics-as-a-service solutions. The company is extensively focused on providing biometric solutions that are cost-effective and secure. 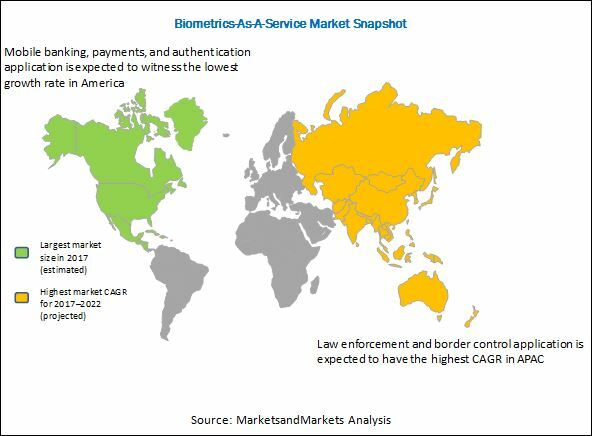 Other vendors in the biometrics-as-a-service market include Fujitsu (Japan), BioID (Switzerland), HYPR (US), M2SYS (US), OT-Morpho (France), SUPREMA (South Korea), Leidos (US), CERTIFY GLOBAL (US), ImageWare Systems (US), IriTech (US), SkyBiometry (Lithuania), Polygon Innovation (Portugal), RightPatient (US), VoiceIt Technologies (US), Athena Sciences Corporation (US), SmilePass (UK), BYTES TECHNOLOGY GROUP-Bytes SI (South Africa), SecurAX (India), Accenture (Ireland), Fulcrum Biometrics (US), AimBrain (UK), Certibio (Brazil), VoicePIN.com (Poland), and SpeechPro (US). These market players have adopted various strategies, such as partnerships, collaborations, and expansions, to remain competitive in the market.